Johnny finally managed to get 'round to digging out a few old snaps of his Pan. 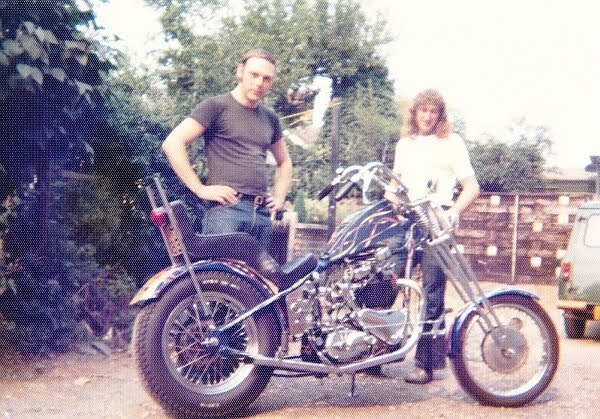 He bought the engine off of Freddie Warr back in 73 or 74, sold his two year old Combat Commando to sponsor the build. Back in the day, the only adverts in the Harley section of the Motorcycle News was the one for F H Warr of Kings Road Chelsea and occasionally an ex-military 45 would crop up. Big Twins were certainly few and far between in Blighty back then. The motor itself was shipped in from South Africa and reportedly came from an old police bike. The scarcity of H-D parts explains the strange mixture of other parts used in the bike. The frame is a heavily modified 45, whilst the gearbox, clutch and primary case is all Triumph Thunderbird. This picture shows the bike as first built and registered in 1975, slightly over stock custom springers, sporting the period twin square spotlights. 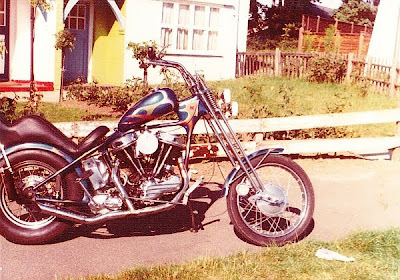 To modern eye it looks a little crabby, but back then it was a chopper man, and better still it was a Harley chop. 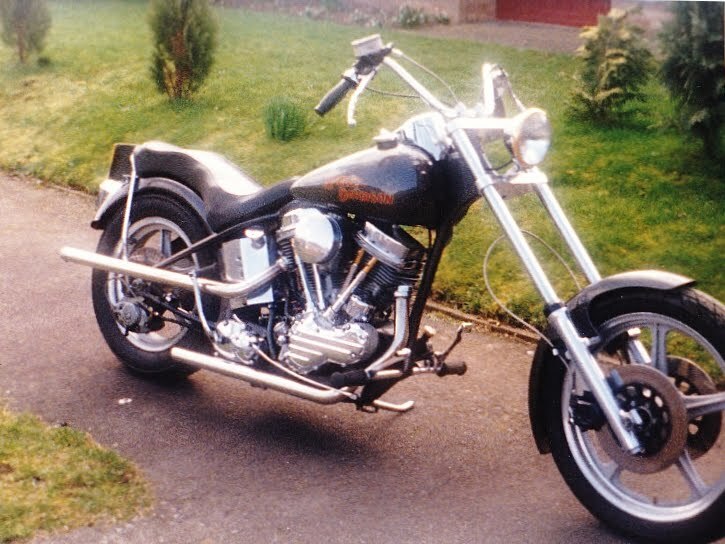 When it was sold in '98 it morphed into this, gaining a set of Yam XS650 wheels and some extra rake in the neck. The other changes are pretty evident and it ended up a nice looking bike that would still cut it today. As a point of interest, the Trumpet gearbox and clutch handled the power without complaint for all those years. This here is Geoff, still about but deals more in the resto side of the game now, still a Triumph man though. I think that Geoff built the first real chopper I ever saw, a rigid A7 with extended girders and moulded tank. When we were about 17 he had a god like status around here, as can be seen by the well versed posing displayed above.